Zucchini, a summer squash, thrives in warm weather. A frequent addition to summer vegetable gardens, zucchini is a prolific producer form midsummer until the first fall frost. 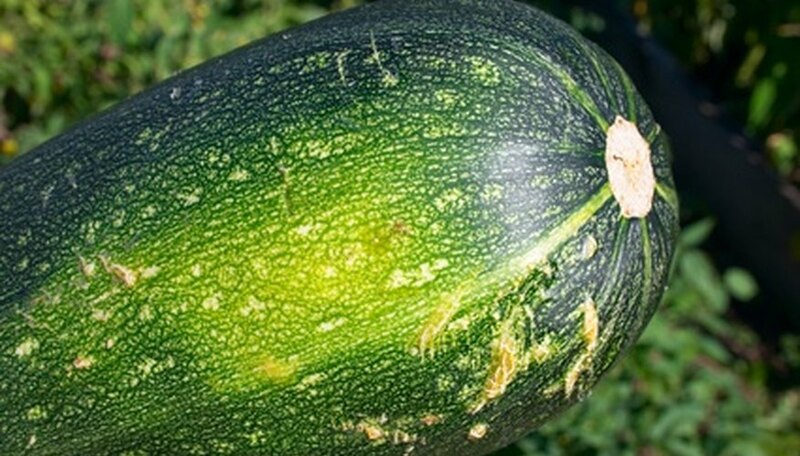 Zucchini seeds do not germinate in cold soils, but the plants also do not tolerate transplanting well, so seeds started indoors are sown in plantable peat pots. Sow the seeds directly into the garden bed once the soil temperature reaches 55 to 70 degrees F and all spring frost danger is past, or start seeds indoors four weeks before the last expected frost. Apply a 2-inch layer of compost over a full-sun garden bed. Spread 1 lb. of 10-10-10 fertilizer over every 100 square feet of bed. Till the compost and fertilizer into the top 6 to 8 inches of soil prior to planting. Sow seeds ½-inch deep, spacing the seeds 2 inches apart along the row. Space rows 2 to 3 feet apart. Water the bed after planting until the top 6 inches of soil feels moist. Water one to two times weekly thereafter, moistening the bed to the 6-inch depth. Thin the seedlings once sprouts appear, usually within one to two weeks of planting. Pluck out the extra seedlings in each row so that the zucchini plants are spaced 8 to 12 inches apart. Fill a 3-inch diameter peat pot with potting soil. Use a sterile potting soil or one that is sold for seed-starting purposes. Plant two zucchini seeds in each pot, planting them ½-inch deep. Water the soil until it is evenly moist throughout. Cover the pots with a plastic bag, which retains the moisture in the soil during germination. Place the pots in a warm room, around 70 degrees F, to germinate. Remove the plastic bags once the seedlings sprout. Pluck out the smaller, weaker seedling if both seeds germinate, leaving only one plant in each pot. Place the zucchini in a sunny window. Water the soil as needed to keep it moist but not soggy. Transplant the zucchini into the garden once soil temperatures reach 70 degrees F. Plant the entire peat pot in the ground, as it breaks down in the soil. Space the plants 8 to 12 inches apart in rows that are 2 to 3 feet apart. Tear the rim off the peat pot before transplanting indoor zucchini. If the rim protrudes above the soil level, the pot wicks moisture away from the zucchini roots.